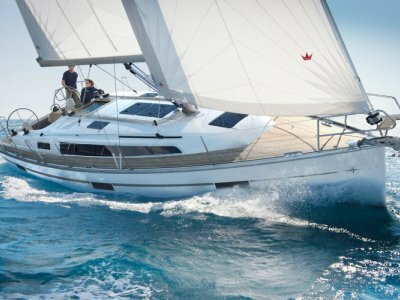 Van De Stadt 38 Cruising Yacht. Gypsy Hawk is a beautifully presented ‘Helena’ design cruising sloop by Van de Stadt. 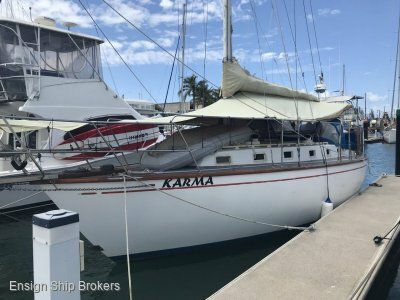 She is a true sailors yacht that has been set up ready for a Pacific cruise. A strong, durable epoxy with timber planked core hull as per the Van de Stadt design has created a beautiful boat with immediate WOW appeal. 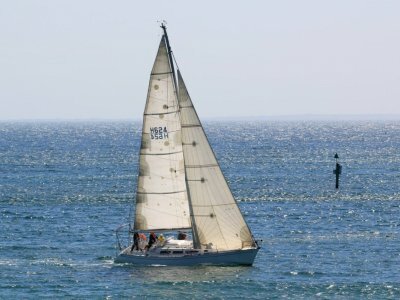 Excellent sails and a good solid looking rig, quality deck gear, auto pilot, Airies windvane and a large, solid contained cockpit area make this an excellent choice for anyone planning coastal and offshore cruising. The choice of tiller steering has allowed for a mass of room in the cockpit and a true sailors feel on the helm. A bright and airy saloon and galley area are finished in Niugini Rosewood timbers with excellent joinery skills. Tongue and groove joins in cupboards and draws just show the level of pride and workmanship that has gone into the fitout. Wrap around settee with fixed table (and wine cupboard or course!) port side and lounge starboard. Forward V berth is ample sized for two adults with full standing room in the forward cabin. 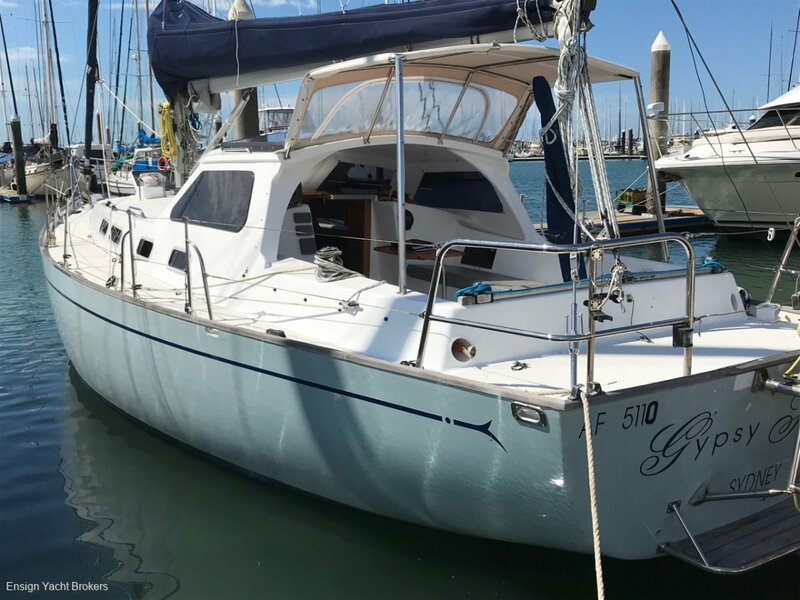 Port aft is a queen sized bed with plenty of open space and head room, makes her a great live aboard option as well. Large L shaped galley is very functional and practical with twin sinks and foot pumps for fresh and sea water. 4 burner gas stove and oven and a deep eutectic fridge / freezer. Good cupboard space with storage above and below the preparation bench plus some in counter storage. Pull away the companion way stairs to reveal excellent access to a very tidy engine bay with a Nanni diesel. Gypsy Hawk is a delight to be on board. 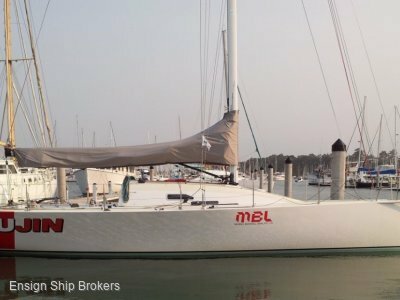 Very well priced, ready for sale and ready to sail. True modern look in a classic design yacht. Book an inspection through the Ensign Mooloolaba Marina. BATTERIES: 2 x House, 1 x Start. Mainsail (Struts ex condition), Headsail, MPS. 2 x Cockpit winches, 2 x Mast winches, Ronstan blocks & cars.